A little before we left for Belize I finished a project in Walnut Creek that I’d been working on for a while. No garden is ever truly finished and there are still a few things to do in this one — redoing the handrailing, painting the wall — but I’m not the one responsible for that phase so I get to call it done. Much of this project was done during the period of heavy winter rains in December and then there was a long delay while the light fixture for the wall was decided on and then fabricated. 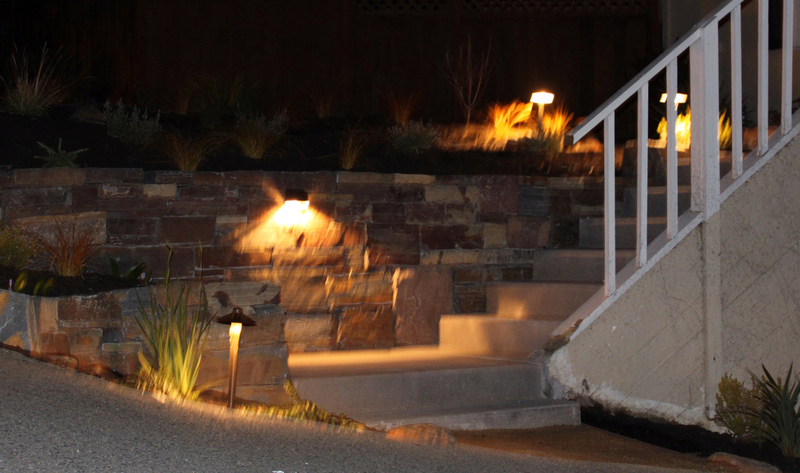 Landscape lighting generally gives more immediate gratification than any other aspect of landscaping, but we had a hard time finding the right fixture for this one. 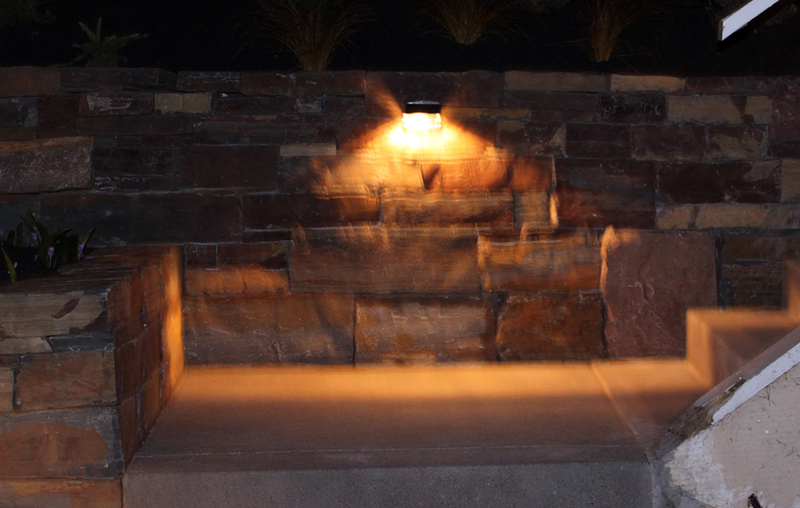 There are tons of lantern-style lights designed for eight-foot-high stuccoed walls, but not many for a three foot retaining wall of stone. Some photos of lighting (which for some reason has attracted the biggest flurry of spam that I’ve seen in a long time) are below. After installing the lighting in daylight, I went into town to eat dinner and wait for darkness to let me see what I’d done. In town, I took a couple of photos of the veteran’s memorial, before dinner and then afterwards. 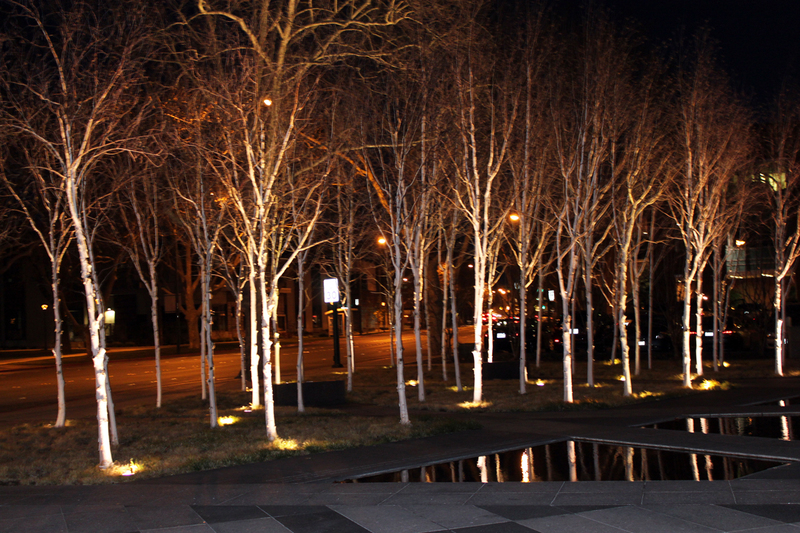 It’s one of the nicer memorials in our area, a grid of birches with granite slabs and paving stone (there’s an article about the stone here) and shallow reflecting pools, and the lighting has quite the ta-da effect. 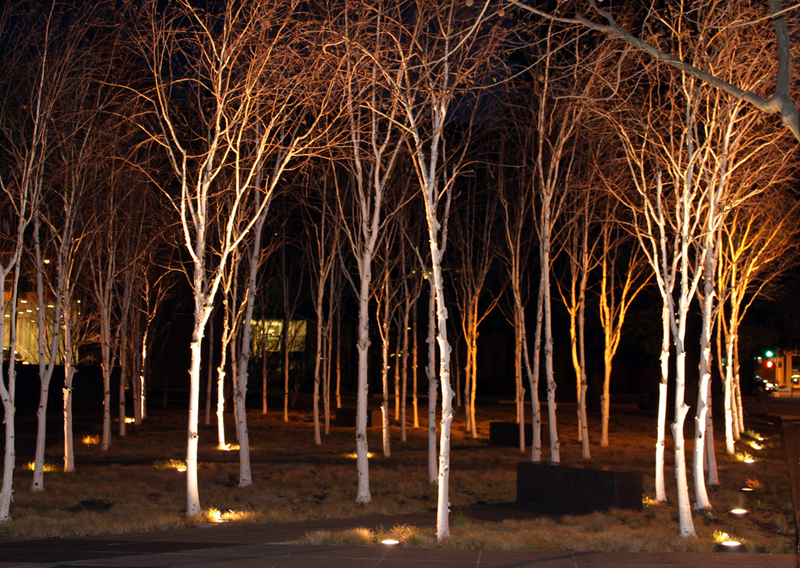 Once you have the fixtures, it feels like a bit of landscape magic when you hook them up and the garden suddenly develops a presence after dark. This was my first time trying to photograph lighting. I didn’t exactly capture the magic, it was completely dark by the time I finished adjusting all of the lights and I didn’t have a tripod or much of a clue what to do with the camera, but I like the images anyways. 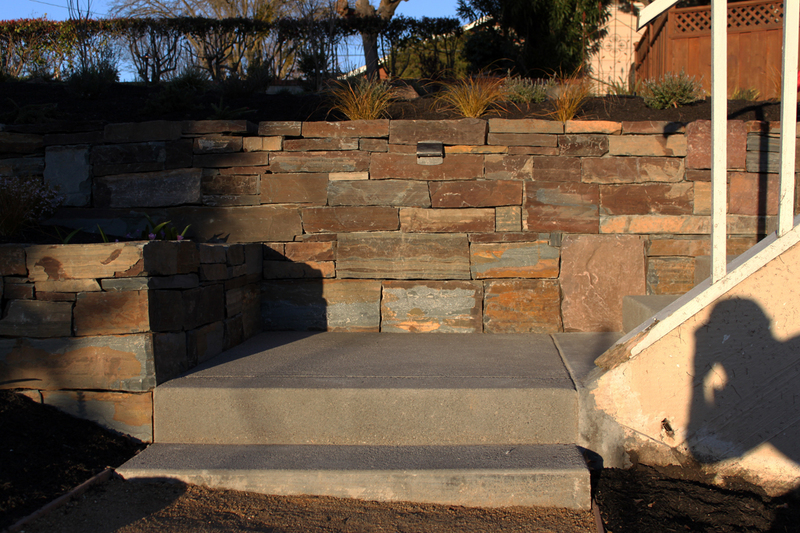 This entry was posted on Sunday, April 10th, 2011 at 6:51 pm and is filed under stone, walls. You can follow any responses to this entry through the RSS 2.0 feed. You can leave a response, or trackback from your own site. (Now I only wait for solar lighting to get just a little better so this can be done without the messy wires etc). I know what you mean. I would like to use solar lights, but so far they manage to be the most unsustainable because they are so ineffective and need replacement so quickly. I’m just waiting for the LED’s to get good enough, but they’re not quite there yet either. I love the color of the stone in your wall. The lighting seems to pick up its warmth nicely. 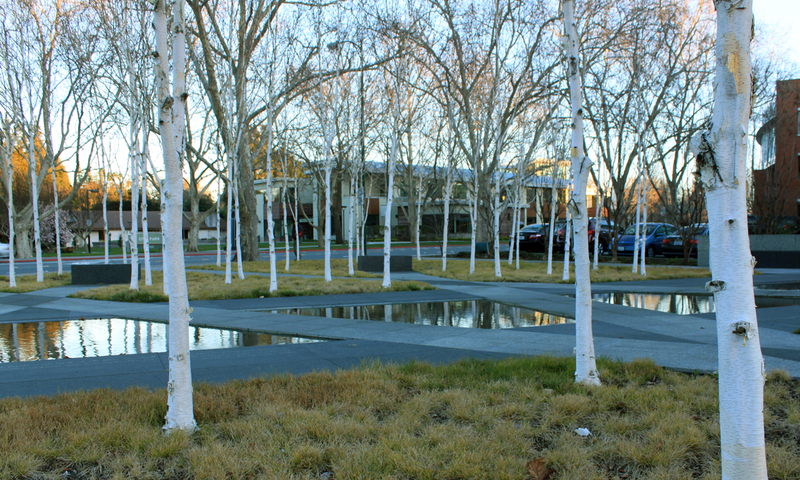 The memorial looks like a place I’d want to see in plan, or maybe by Google Earth. 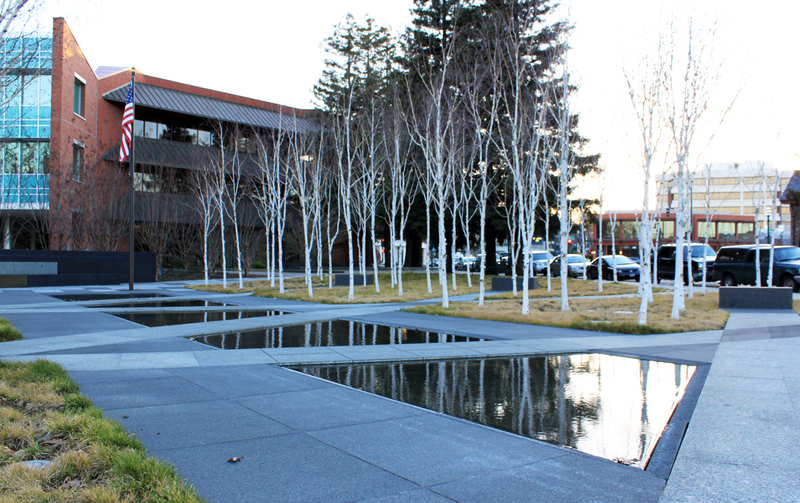 The crossing lines of hardscape look like they’d reveal an interesting design when seen from above. Painting the wall? Not the stones???? ?